To collect something, you need to drag a villager to it. Use mouse wheel to zoom in or zoom out the scene. Puzzle 1: Light up the bonfire and repair the love house. See below screenshots. Firstly drag a villager to the coconut husks, he will collect the husk to the bonfire (1), then drag a villager to the wood and bring the wood to the bonfire (2), drag a villager to the bonfire to light it up (3). Drag a villager to the love house to repair it (4). Puzzle 2: Repair the deck. See below screenshots. Firstly collect 3 boards from the island (1) (2) (3), the villiager will drop these boards near the deck, then drag a villiager to the boards to repair the deck (4). 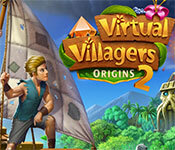 Sign-up to get informed when the Virtual Villagers series has new game released with BD Studio Games' FREE bi-weekly newsletter.